Chef Eric Jacques Crowley is a seasoned, professional chef and the founder, owner and chief instructor at his dynamic culinary school, Chef Eric’s Culinary Classroom, where he has shaped the careers of many professional chefs. He graduated with honors from the prestigious Culinary Institute of America in Hyde Park, New York. After traveling abroad to master European cooking techniques, Chef Eric returned to the United States and landed a prominent position at Patina Catering, of the renowned Patina Restaurant Group. With his experience and training, and his innate passion for cooking, Chef Eric sought to help others develop their cooking skills and gain confidence through the culinary arts. This led Chef Eric to open the Culinary Classroom in 2003, as a place where people with all levels of culinary experience could hone impressive and valuable culinary skills. Chef Eric and the Culinary Classroom have been featured in, and on, major media outlets that include E! Entertainment, KTLA 5 Los Angeles, KCAL 9 Los Angeles, NBC Channel 4 Los Angeles, Good Day LA, ABC, Associate Press, TruTV, Hallmark Channel, BET, Los Angeles Times, Los Angeles Business Journal, Daily Mail, VoyageLA, and many others. “People can derive a great deal from the art of cooking. The ultimate reward for me is seeing the sense of confidence and pure joy that my students experience when they master the life skill of cooking through my instruction, and to help other chefs follow in my footsteps and create their own businesses and careers,” exclaims Chef Eric. Additionally, Chef Eric is a judge and scholarship sponsor for the Careers through Culinary Arts Program (C-CAP) in the Los Angeles Unified School District, and he mentors children from high school into their professional careers. He is also a mentor for the Culinary Institute of America (CIA); supporting interns and his professional students, by training and preparing them, and personally guiding them so they can meet the requirements to attend the CIA. He is the creator of Chef Eric Crowley’s Savory Seasonings, Sizzle and Smooth, a duo of spice blends that add the perfect amount of heat and fabulous flavor to all types of dishes. 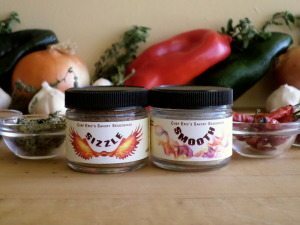 Each jar is blended by hand to ensure optimal flavor, with Sizzle adding a bit of fire to dishes and Smooth offering great flavor without that extra kick of heat. 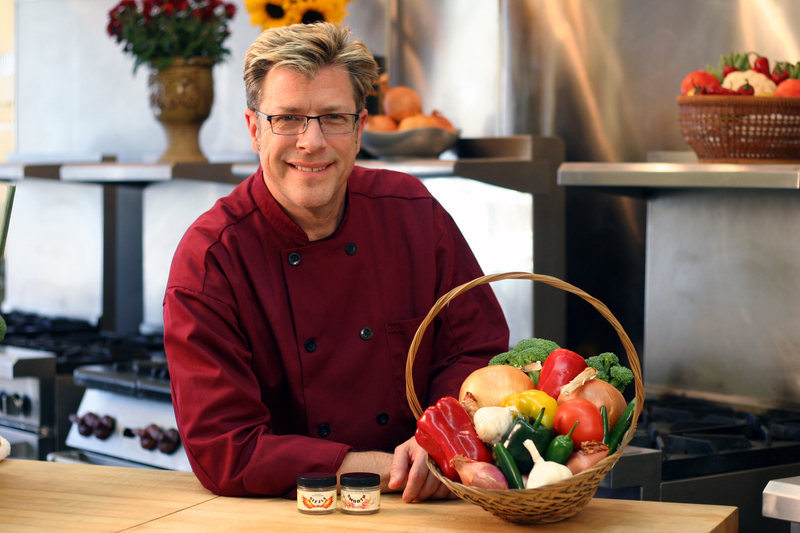 Born and raised in Los Angeles, California, Chef Eric was exposed to an eclectic variety of foods and cultures. His palate and cooking skills were also greatly influenced by his mother, who was a gourmet cook. As he grew older, Chef Eric discovered a true passion for music and became a dedicated member of his high school band, as the lead saxophonist. Interested in furthering his talent, he enrolled in Cal State Northridge working towards a degree in music, continuing to play the saxophone in the junior band. With the dreary prospects of a low-paying future as a musician, Chef Eric left Cal State Northridge and entered the work force, first as a bill collector, and then as a paralegal assistant at a law firm. Despite his stable position at the law firm, Chef Eric felt that he wasn’t living his dream. 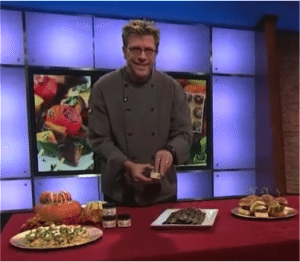 Chef Eric uses his Sizzle and Smooth spice blends to spice up his tailgate snacks for football season on KTLA. Check out his YouTube Channel for more tips / tricks. At the age of 27, he began experimenting in the kitchen with a hand-written cookbook from his mother. As his passion and joy for cooking grew, he attended a cooking class, where his ambition and eagerness led to the development of a mentorship with the teacher and a new part-time job in a restaurant. After researching various programs and connecting with alumni, Chef Eric decided to fully invest in his bright future as a chef and was accepted into the esteemed Culinary Institute of America in Hyde Park, New York. He completed the rigorous and rewarding degree program, graduating with honors. In search of greater technical advancement, Chef Eric traveled abroad to train with Chef José Munisa at Via Veneto, Barcelona’s longest-running 5-star restaurant, and Chef Joseph Russwürm at Munich’s Hotel Kempinski, another 5-star establishment. Chef Eric returned to the United States and accepted a respected position at Patina Catering, of the distinguished Patina Restaurant Group, where he prepared food for A-list celebrities and for award shows that included the Primetime Emmy Awards Governors Ball. He has supervised corporate and personal events ranging in size from an intimate four-person lunch or dinner, to a boisterous crowd of 2,000 for lunch, dinner or appetizers. He has cooked meals for presidential candidates, vice presidents, show business executives, celebrities and numerous personal clients. During this time in his career, Chef Eric maintained a busy schedule of catering events and high-profile cooking demonstrations. In addition, Chef Eric began teaching professional chef programs at Los Angeles’ first private culinary school, The Epicurean School of Culinary Arts, which has since closed. When he decided to start his own culinary school, his partner and wife Jennie drew upon her extensive background in business administration, marketing and customer service to help him launch and grow Chef Eric’s Culinary Classroom. In 2003, Chef Eric officially opened his Culinary Classroom, as a place where aspiring cooks, chefs, bakers, and pastry chefs of all skill levels could find challenging and rewarding classes to suit their needs and elevate their own love of cooking and baking. Chef Eric’s Culinary Classroom offers a wide range of recreational and professional classes, with a calendar that is constantly updated to reflect current gastronomic trends and the needs of its customers. With an emphasis on hands-on learning in an intimate environment, Chef Eric takes great pride in patiently focusing on each of his students to motivate them to reach their goals and develop superb culinary skills. His humble attitude and ability to intently listen and provide encouraging feedback, promotes a cohesive and productive learning environment. Chef Eric’s students include successful restaurant owners, professional chefs, caterers, personal chefs, home chefs, beginning cooks and children. In an effort to give back to the community and further promote the culinary arts, Chef Eric is highly involved with several charities and programs, donating thousands of dollars of cooking classes and scholarships to children in need. Over the years, Chef Eric has become devoted to CoachArt, a program that does incredible work helping children with life-threatening illnesses, to improve their lives through art. “We host some of the children at the Culinary Classroom to get them out of the doldrums of going through treatment and having to stay in the hospital, and have them come cook and dine with us. The children inspire us every day with their courage,” says Chef Eric, who teaches Children’s Culinary Academies at his school in the summer. Chef Eric continues to reside in Southern California, with his wife and business partner Jennie Crowley. In his spare time, he enjoys do-it-yourself home projects, the thrill of Grand Prix motor races, watching Football, listening to jazz, playing with his Dachshund puppies – Basil Boy and Lucey Pickles, and cooking /grilling, using the herbs he grows in his garden. Loved it! Instruction was great, I loved that we could keep the recipes, and Eric was funny. I’d recommend to anyone. You run a great cooking program. Jonah and I enjoyed it tremendously and we learned a lot. He will be back… and maybe me too! Thanks you! With the skills Chef Eric taught me, I have ventured into the world of private chef-ing. I have been working with the same client. I travel with him and it is absolutely a fantastic career. Thank you!